Walt Disney's classic Mary Poppins and Quentin Tarantino film Pulp Fiction are among 25 titles that have been added to the US National Film Registry. Who's Afraid of Virginia Woolf? and Michael Moore documentary Roger and Me have also been chosen for preservation at the Library of Congress. Other new additions include John Wayne film The Quiet Man (1952) and sci-fi favourite Forbidden Planet (1956). This year's selections bring the number of films in the collection to 625. The registry was instigated in 1989 to ensure that notable titles from America's movie history would be preserved for posterity. The films admitted, which must be at least 10 years old, are selected from hundreds of titles nominated by the public. "The National Film Registry stands among the finest summations of more than a century of extraordinary American cinema," said the Librarian of Congress, James H Billington. Moore said that he was "grateful" his 1989 film, about the economic decline of his Michigan hometown, had been deemed culturally, historically or aesthetically significant. Image caption Elizabeth Taylor won an Oscar for her role in Who's Afraid of Virginia Woolf? Also admitted this year are 1946 film noir Gilda starring Rita Hayworth, 1960 western The Magnificent Seven, 1961's Judgment at Nuremberg and 1983's The Right Stuff. A Virtuous Vamp, a 1919 silent film starring Constance Talmadge, and Daughter of Dawn, a 1920 romance with an all-Native American cast, are the oldest of this year's new additions. 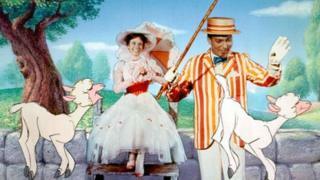 The inclusion of Mary Poppins coincides with the release of Saving Mr Banks, a drama about how the Disney film came to be made. The relationship between Who's Afraid of Virginia Woolf? co-stars Richard Burton and Elizabeth Taylor was also explored this year, in a BBC Four drama starring Dominic West and Helena Bonham Carter.